I finally got around to redoing the lasagna recipe with a much drier sauce. By sweating off the vegetables and by using the basket-on-top-of-the-lid technique, I was able to get rid of some of the water that was the problem in Version 1. This recipe does look like a lot of work because it’s got quite a few ingredients and steps – however, it is actually pretty easy as there’s isn’t a lot of preparation and you can just set the timer and you have lots of time to get ready for the next step. 1. This makes 4 very generous servings, so it will feed 6 if you serve it with something else – like a salad or steamed veggies. 2. In the interest of full disclosure, cooking the sauce on Varoma did burn the bottom of the bowl, so if you want to avoid the extra cleaning, then cook the sauce at 100C and add extra cooking time to allow the water in the sauce to evaporate. 4. Take leftover sheets and cut into 1cm strips to make into fettuccini. They can be frozen in sealable bags. 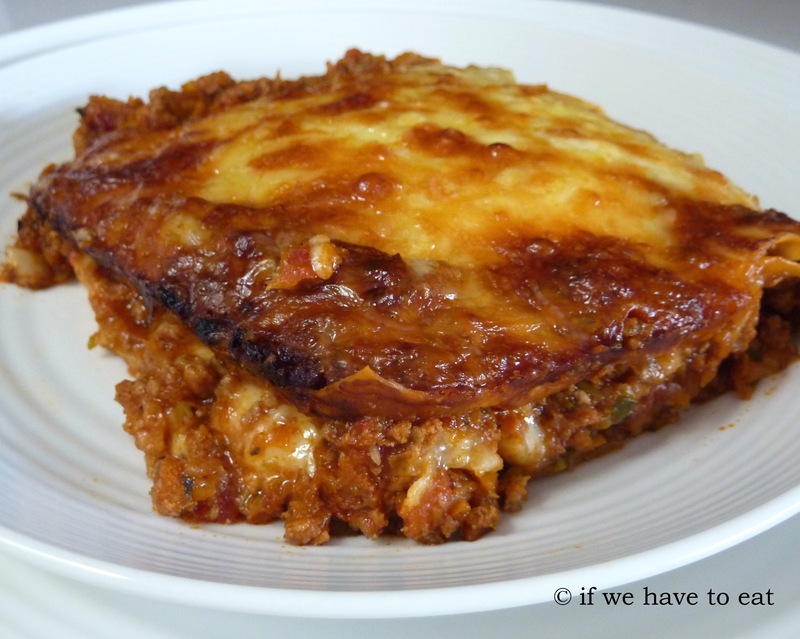 This entry was posted on March 23, 2014 by ifwehavetoeat in Mains and tagged Feed a Few, Mains, Make Ahead, Meat, Pasta, Pie, Recipe.